Today’s article1 by Colin Tatum is a depressing read though not quite as depressing as its title suggests. 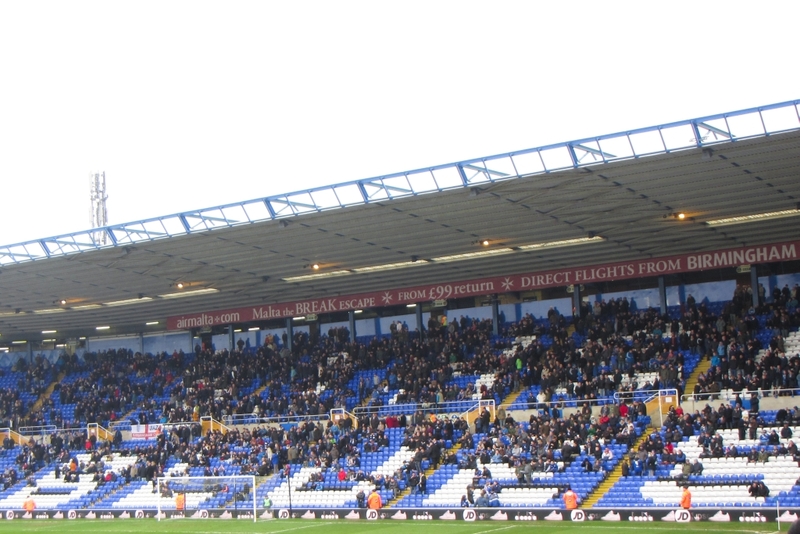 I assume some subeditor came up with the title, Birmingham City are teetering on the brink of oblivion, because Tatts used the Horace Greeley quote about apathy being a sort of living oblivion. It’s hard to assess the state of mind of those who don’t go to games but I don’t think that ‘apathy’ is the right word to describe all of them. Apathy means loss of interest and some of those who stay away are still very interested in the Blues but have various reasons for not going. Some are staying away as a protest against the owner and others because of the standard of football being played. These days there is a wide choice of other entertainment available for anyone who regards football as an entertainment product rather than a lifetime commitment. As for those who do go to games, the mood of those who sit near me in Block 28 seems to be that of resignation; they don’t like the situation but don’t think there is anything they can do about it. They are like parents who turn up to witness their tone deaf offspring sing in a talent competition; they come because they are committed to the Blues and will support them however dreadful they are. I remember St Andrews as always being crowded when I went as a child but the statistics show that my memory isn’t accurate; attendance has always been affected by performance on the field. The average home attendance for the 1954-55 season, when Blues came top of Division 2, was 21,002.2 The next season, when they came 6th in Division 1, the average went up to 33,828. The average for the 1964-65 relegation season was 19,714; it was 14,398 for the following season in Division 2. Attendances at most clubs plunged during the 1980’s, as football was affected by mass unemployment, hooliganism and disasters at Bradford and Heysel. The lowest average home attendance at St Andrews was 6,289 in the 1988-89 season, with only 4,026 there to witness the defeat by Swindon on April 18th. This is not the first time that my club has been in trouble. I don’t believe that there is anything fans can do to make our present owners sell the club. Resignation is an understandable reaction for the fans who continue to attend: I hope that there is also a determination to hang on and be ready to pick up the pieces when we get a chance. This entry was posted in Birmingham City FC, Football and tagged Birmingham City F.C., Colin Tattum, Football on November 6, 2013 by Puddleglum. fair and balanced view. we’ll done. Find the Mail like the Council to be less than supportive of our beloved club e.g. New grond plan. Victory parade after winning Carling Cup. block 15 has a similar feeling of resignation to that of block 28. however it takes only a glimmer of light to rekindle the spark. hopefully we regulars can keep the flame going until the rest of the faithful return. Most people i talk to that don’t go give the reason ‘they are just plain bored with the whole Blues situation and just can’t be bothered. Good points Margaret. So why are we more fed up this time. I have gone to most home matches since March 1973. In those 40 years we have only been in the top flight 10 times (I think) and of those we struggled for 8 of them. I think this time there are three reasons why we are different as fans and there are probably more. We know more about what is going on this time. Last time it was really bad I listened to local radio and read the mail occasionally. There was no internet, no endless football on tv to show me what good football looked like and little analysis of situations amongst fans. I stood watching the swindon match. I didn’t have a season ticket and I didn’t know anyone who did. Today I sit by the same people each match and we discuss the situation and pull each other down. My season ticket encourages me to go when I could do other things. If I have changed as a fan so much in 30 years , so have others I assume. CORRECTION….BLUES HAVE BEEN IN THE TOP FLIGHT FOR 17 OF THE 40 YEARS SINCE 1973….. I don’t go to the Blues at the moment because there is no point. The owners are only interested in taking money out and selling anything of value they can get their hands on. They are selling the clubs future and don’t care what I or any other Blues fan thinks. I will not contribute to this and help them do it. When I go to the Blues I want to be looking forward to the future not selling it down the drain. I suspect this is going to get a lot worse until it starts to get better. When it does and there is a future I like the other 13000 or so will come back. However I think how the club is owned and governed should now change and supporter involvement is needed to protect the club.